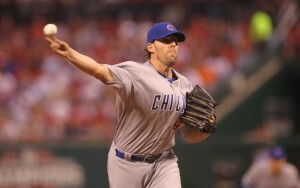 John Lackey returned to St. Louis with Chicago and allowed just four hits over seven innings while striking out seven. He even contributed to the offense with an RBI single in the Cubs 5-0 win over the Cardinals on Monday night. Lackey mowed down 11 hitters with strikeouts and Cubs relievers added three more. While it is a small sample, the strikeout numbers are glaring against above .500 teams this season. According to a stat flashed across Fox Sports, the Cardinals entered the game with the 4th best contact percentage in the National League, around 79% of the time. That number is deceiving. The Cardinals have struck out 113 times in 13 games. Against teams like Atlanta, Milwaukee and Cincinnati (a combined 10 games under .50o), the Cardinals have struck out 62 times in nine games. In the four games against Pittsburgh and Chicago (a combined eight games above .500), the Cardinals have struck out 51 times!